The local history folks are trying to figure this out. It is cropped from passing under a well known local rail trestle. Several things I see right off. First, the picture looks VERY posed. Which doesn't mean much. 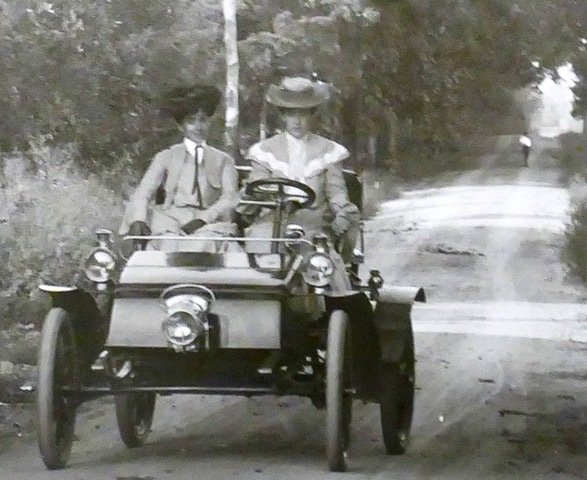 The style of the car suggests American manufacture between 1902 and 1904. Most cars of that early decade of the automobile, built in America, or anywhere else in the world, were right hand drive. That is the way it was. However, there were a few exceptions. One of my first thoughts was Autocar. One reason for that, is that Autocar offered cars in either right hand OR left hand driving. They also offered a choice of tiller or steering wheel up until about 1904 (maybe even '05?). But I do not think it is an Autocar. The front area of the body does not have quite the right shape for one. So unless it had been restored incorrectly? Another thought was Winton. But I don't think they offered left hand drive. It does appear to be a tail-lamp between the body and rear fender. Since tail-lamps usually are placed on the side nearest the center of the road, the car being driven on the right would have a tail-lamp on the left side. This would be an indication that the photo is not flipped, but NOT conclusive. There are several things. None of them conclusive. Focus, contrast, lack of dust, the women's clothing? I would suspect this is a modern photo. And then there is in the background. A man standing there. And something else too out of focus to identify. It appears that there are some wider tire tracks in the dirt road. This may be a modern picture? Wayne, I thought modern too, but then rationalized a glass plate photo which always has sharp depth of field changes? Here is the original photo....I know the trestle bridge, it was still there when I learned to drive. Looks like it's a realative new restoration with models dressed in period clothing. Unless it's a pristine original photo it looks to modern. Looks like authentic road apples in front of the car and behind it also. I wonder if the car is really left hand drive, or if the picture is flipped. I can't see any signs or lettering that would give a clue. George M, Is any history of the photo known? Negative type? There were so many different camera and film/medium types used a hundred plus years ago, and a few of them mimic modern film and/or reactions fairly well. I am not nor do I pretend to be a photography expert. I figure Steve J knows a hundred times what I know. And I don't know how to rate Mark O?! Wow that guy knows a lot! I have seen a fair number of known history photos (including postmarked real photo postcards popular back then) with incredible detail and focus. Years ago, I found a postcard with a photo of an early Maxwell among redwood trees. The photo was oriented with the tall trees going the long way of the RPPC, and the Maxwell was smaller than a dime. But the detail was clear enough that I was able to identify the car as a pre-'10 Maxwell without using a magnifying glass. So I bought it. A friend of mine had (still has) a 1907 Maxwell, so I had the car from the photo blown up into a 5X7 photo (from smaller than a dime!) and gave it and the postcard to my friend. The detail was clear enough that he was able to identify not only the model of the car, but the maker of the horn! The larger view doesn't convince me of anything. If I had not seen the closeup? I would likely have never suspected it may be a modern (relatively speaking) picture. But the devil is in the details. I did wonder about what looks like road apples in the background, and those ahead of the car certainly look real. But I figured Amish country and a few horses would account for that. And exactly what Ed B mentioned. The road and tracks themselves. Most roads outside of towns before 1910 were little more than horse trails and wagon tracks. Some exceptions along the Eastern Seaboard. This road is fairly wide (for a single lane), and it is incredibly smooth. Nearly all roads, in or out of town, were rough, horse trotted, and wagon wheel rutted. Horses and wagons almost never went over ten miles an hour, and in the early days of the automobile, most areas restricted a car to similar speeds. 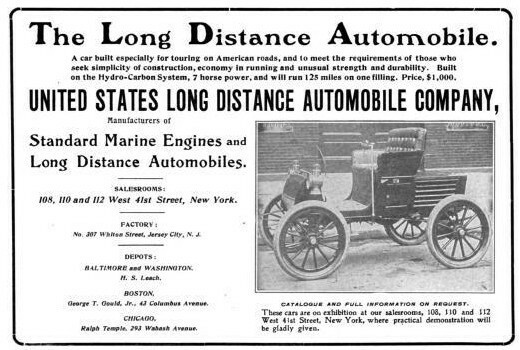 Smooth roads were not needed at those speeds, and efforts to improve roads for faster automobiles had begun by 1905, but had not gotten very far for another decade. The tire tracks in the road do not really show up well in the full version. However, in the closeup, the are a number of things that we can (or cannot) see. I would say that horses have been through there. However, the surface of the road is not broken up by hooves. So I would say maybe not a lot of horses. And the tire tracks. All early cars had skinny tires. For the most part, in that part of the picture, there are two nice tracks from cars and/or wagons, the tracks are heavily traveled in their center, fading out to each edge. Two tracks (for the lefts and the rights of cars and carriages) over a foot wide each, with a center area about three feet wide where few tires ran. IF (that big IF) it were early cars, it would take a lot of cars with skinny tires (in the neighborhood of fifty) nearly all traveling within inches of the same center-line to create such a track. That many cars, with barely a handful that wandered to one side here or the other, is possible, but unlikely. It would only take way less than half that many cars with six inch wide tires to create the same effect in the dust. With just a few skinny tires (like from the pictured car) to create the few odd tracks I can see. I am hoping for more facts, and speculations, to help date the photo. And I am still trying to think of another automobile it might be. I don't think it is an Autocar or a Winton. I also do not think it is a Rambler or a Cadillac model B (although they made some cars that look similar). I am also hoping to hear from a real expert about the photo process involved (cause I ain't a real expert on that!). The only photographic clue that would point to modern is the color of the car. Cars of this period were often red. Emulsions of the period were orthochromatic, meaning they were blind to red light and would render red objects as black or dark gray. A modern panchromatic emulsion would be sensitive to red and would render it a lighter gray, like the car in the picture. BUT that applies only if we know the car is red, which we don't. The question of glass or film is mostly irrelevant. Neither one, used in the came camera, will produce pictures any sharper than the other. The only reason that glass plate pictures tend to be any sharper than film pictures is that they were large and were generally used in large cameras with good lenses, while film was more likely to be used in box cameras with fixed focus lenses. But a 5x7 camera, for example, will produce photos of equal quality on film or glass. Almost purchased a 1904 Autocar at a Hershey auction a few years back, This is not an Autocar hood in my opinion. The Autocar hood sits atop a very exposed radiator. I would like to see the photo reversed.Now that I look at the photo more closely one identifying piece is the shift lever on top of the steering column. You can see the shift lever affixed to the shaft going down the column. My alleged mind tells me Autocar had a column hand shift so maybe my memory is faded some. This may be an earlier Autocar perhaps 1903? Greg Lang is a very knowledgeable Autocar owner and if he see's this photo he would be the definitive answer. Having worked as a civil engineer for AT&SF railroad for a while out of college I'm looking at the trestle. The stone abutments look OK for 1905, and it is a open deck trestle, meaning that the railroad ties sit directly on the girders, that is also OK for 1905. The problem is with the built up girders them self, they look to be from a later time. Built up girders are made from several parts of steel and riveted or welded, something from 1895-1905 era would have had more rivets. Many railroad bridges were upgraded with new girders to carry heaver loads around 1940. 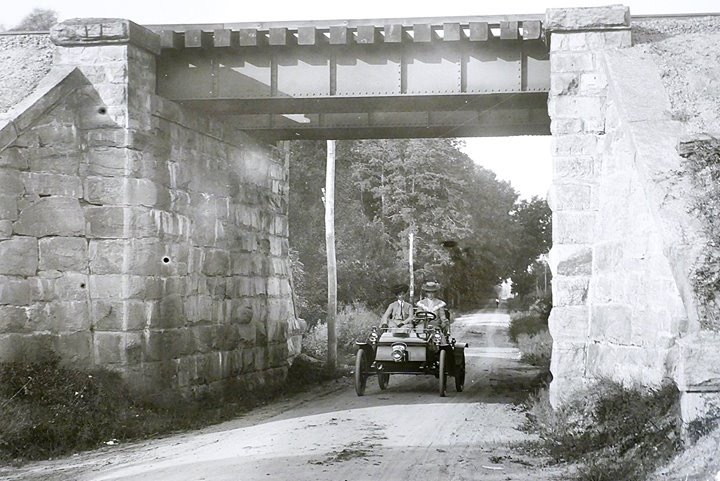 It sounds like this bridge is in New Jersey someplace, could this picture be a publicly still shot for movie that is set around 1905 but is filmed around 1940 ? Those power poles with the 2 insulators look pretty primitive for post-20's. It also appears the two wires leading to the insulators on the pole pass under the overpass which would indicate not staged. Unfortunately, this mystery is not like one of Rob Heyen�s where he eventually reveals the answer. I don�t know if it was Photoshopped or era equivalent overlay merge�and I certainly do not know the car. Thanks for all the input so far. It is always fascinating the areas of knowledge the forum members have such as turn of the century construction techniques�early camera expertise, power pole clues, etc. I�ll share what I do know. This may have been one of the first trestle conversions to steel as this IS the right of way line where the Pennsylvania always ran its world speed records in the era. Let the competing Reading RR chip the record, next day the Pennsy would go out and take it back. History holds that at one point, perhaps 15 miles east of where this photo was taken the two railroads use to set departure times so that a true high speed race could be held where the competing lines ran visually parallel for a stretch. The road was actually an early commerce road that was mule wagon from about civil war onward. To the horizon in the distance It connected to a village centered on making the supposed best white lead paint in the USA (John Lucas Paint Co.founded in 1854-acquired by Sherwin Williams in the 20�s) to a rail freight center in Clementon NJ which was on the Reading Railroad line that was maybe 1.5 miles in front of where the car sits. The village had access to the Pennsy along the Philadelphia Atlantic City line with similar road to freight depot to the east of about 4 miles or to the west about 4 miles. The Pennsy finally relented and ran a switched spur into the village sometime after the family stewardship ended. That bridge stayed that way until the 60�s. I remember the open span, ties resting on the girders. In my day it was blacktopped from abutment to abutment with a line in the middle that made straight driving an illegal move. Cars would cue up in a line leaning towards the curb along each side�and folks just decided friendly how a chain of cars could pass with the other direction waiting for a break and vice-versa. The car in question appears too clean for me suggesting a promo picture for a new delivery�but really, I know of no monied homestead at that location at the time and it is more than a mile or two in any direction before there was real civilization where monied folk would have been. A source wishing to remain anonymous in case his guess is wrong has suggested to me that this could be something called a �United States Long Distance� machine which was built in NJ for the first single digit years of the 20th century. I can find nothing to make that corroborate. Try posting on the AACA site - there are some guys there who love this kind of mystery and are sure to peg it right on. Several times yesterday, and already a few times today, I have googled different cars of the '02 to '05 years. And I am still no closer to identifying that car than I was in memory alone the first five minutes I looked at it. While the basic style is quite typical of those few years, the specifics of that car don't match anything I can place (at least not yet). Packard and/or Winton actually come the closest. Interestingly. both on the models used in attempts to be the first coast to coast driven car. Horatio Nelson Jackson (I had to google the name to get it right although I knew the Jackson part), a doctor of independent means in a Winton, in order to win a barroom bet, beat the Packard factory sponsored Packard which finished only a few days later. Horatio's ride is an incredible tale on so many levels, and a made for television movie was made about it. Very well worth watching if you like history or personal adventures. The Packard car was nicknamed "Old Pacific" (if I recall correctly). Googling either car will likely get pictures of both of them. Which makes researching a bit difficult because the two cars look somewhat alike. You often have to follow the google links into the source page to find out which one the image is unless you already can tell the two cars apart yourself (I am not quite that good). 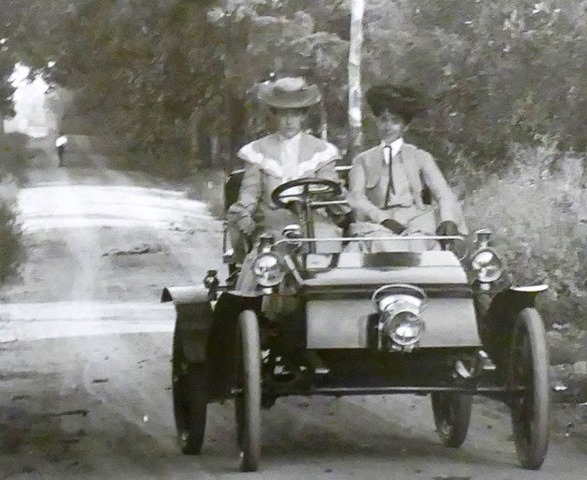 Both Packard and Winton in 1902/'03 had a runabout model almost exactly like the car in the photo. And it is possible that the car could actually be either one of them, with some variation that I haven't yet found a photo of. The key difference for both of them, is that the radiator was mounted below and behind the front of the hood (as it were). All the pictures I have found so far showing either car's front hood clearly show a sort of a grill in the front which this original post photo clearly does not have. Otherwise, basic lines, shape of the "hood", and even front springs are all within a match. Some of the cars, the front fenders even match, and most cars in those days varied enough during production to not discount a car because of a slight difference in the fenders. Autocar, Cadillac, and Rambler all built cars of similar body lines and low sloping front hoods as this car appears to have. Cadillac and Autocar both had versions that did not have a grill in the front of the hood. All the similar Ramblers I have looked at in the past two days did have a grill in the front. And all three of those, Autocar, Cadillac and Rambler, had hoods that sloped in a similar fashion to the OP photo car. However, all three also had distinctive flaring of the hood clearly unlike the OP photo car. The OP photo car's hood sides may not be totally straight, but they are nearly so. That characteristic is shared with both Winton and Packard. The lighting on the front of the OP photo car isn't great. Clearly there is no grill in that hood. I "think" I can see the radiator hanging between the frame rails below the hood. Google either the '04 Cadillac (it was a one year only model B I think?) or Autocar (from about '02 to '05) and you should be able to see what I mean about the flaring of the hood. All of those cars had the engine under the seat. The "hood" may have had a small "trunk" in it, and likely hid the gasoline and maybe water tanks. While the light in the middle would be in the way, both had steering wheels, similar slopped fronts that could open for more seating or carrying and nether had radiators across the front, at least that went into the body. One of our members bought a French car that was advertised as a Model T a few years ago. I have photos someplace, but it looked a lot like this one, especially the 3 lights looked the same.